Celestial lily, in the iris family, blooms only in the morning. Its showy, lavender-blue flowers shine like six-pointed stars. A perennial herb with grasslike leaves growing from a bulb. Flower a six-pointed star borne at the end of the branches, to 2½ inches across, sky blue or blue violet. One to two flowers emerge from a common spathe (a sheathlike leaf); each flower blooms for only one day, in the morning, and then closes in the afternoon. Blooms April-May. Leaves 3 or 4, very narrow, long and folded (thus the name “pleatleaf”), clasping the stem. Root a bulb deeply underground, often in sticky clay. Similar species: Nuttall’s pleatleaf (N. nuttallii), of the Ozark Plateau, occurs in similar habitats but apparently does not grow together with celestial lily. Its leaves are narrower than celestial lily’s, and its flowers are more purplish blue and open in afternoon and close at night. Bees, flies, and other insects gather nectar from the flowers of celestial lily, pollinating them in the process. Occurs in glades, prairies, and rocky slopes on calcareous substrates. Celestial lily is not common but is sometimes found in large colonies on glades in the shade of eastern red cedars or Ashe’s junipers. 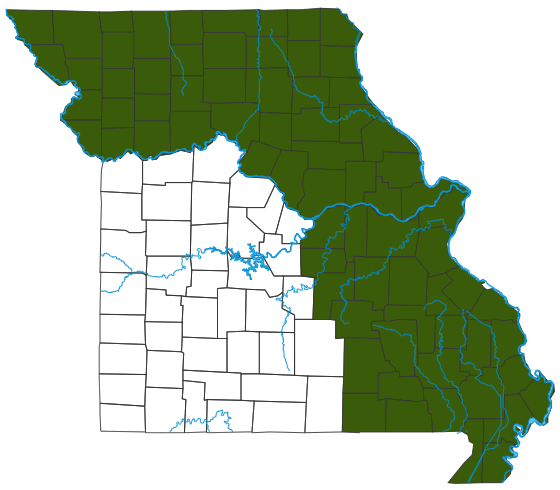 Scattered in the Unglaciated plains Division and in the eastern portion of the Ozarks and Ozark Border divisions. The species name “geminiflora” refers to the flowers that are frequently paired in the spathes (“gemini” meaning “twinned”). This plant is not technically a lily; it is in the iris family. How can you tell the difference? In irises, the flower’s ovary is positioned below where the petals and sepals seem to attach, and not above them; also, irises have 3 stamens (not 6). We often think only in terms of a plant’s economic, medicinal, and biological value, but we must never discount the value of aesthetics and the immeasurable good it does us to ponder the presence of such beauty in a world that often seems full of trouble. Bees, flies, and other insects gather nectar from the flowers, pollinating them in the process. A surprisingly large variety of plants grow in glade communities. Although celestial lily only blooms for about a month, its bulbs persist year long beneath the soil and help prevent erosion.